Global Solar Photovoltaic (PV) Installations Market was valued at $131,818 million in 2016 and is expected to reach $393,594 million by 2023, registering a CAGR of 17.4% from 2017 to 2023. Photovoltaic devices directly convert sunlight into electricity. The key components of PV power system are various types of photovoltaic cells (also known as solar cells). Solar photovoltaic cells are semiconductor devices, which increase power capacity and contribute in the production of electricity for households and buildings. PV installations are safe, reliable, incur less operating costs, and are easy to install. Moreover, the abrupt concerns regarding climatic changes and alternative sources of energy have led to the rapid adoption of solar energy, which is generating demand for solar photovoltaic installations. The photovoltaic market in Asia, especially China and Japan, is expected to contribute largely to the growth of the PV market, globally. This is mainly attributed to the initiatives taken by the government, the key market players being located in the region, and the emergence of building-mounted and ground mounted systems along with, the on-grid segment. In addition, successful PV installations provides power for over 20 years with no fuel costs and maintenance. When compared to diesel generation in particular, PV is a cost-competitive option, especially in the current scenario where electricity and diesel prices are often high. The solar photovoltaic (PV) installations market is segmented based on technology, grid-type, end use, and geography. Based on technology, it is classified into thin-film, crystalline silicon (mono and multi crystalline), and others (organic and concentrator photovoltaics). Based on grid type, it is bifurcated into grid connected (centralized and decentralized) and off-grid. By end use, it is categorized into residential, commercial, and utility scale. Based on geography, it is analyzed across North America, Europe, Asia-Pacific, and LAMEA. Demand for solar power in the emerging markets of all continents, especially in areas where electricity is needed the most, significantly contributes to the market growth. Moreover, the rapid demand of solar installations in residential rooftop applications have led to reduction in price of solar installations, which in turn is also expected to lead the market demand. The additional features of solar installations, such as their low noise producing characteristics and high price of electricity, and other sources such as natural gas is also expected to escalate the market demand. Moreover, rapid expansion of the market is primarily due to the increase in competitiveness of solar photovoltaic and rise in government initiatives and programs due to increased demand for electricity. In addition, countries switch toward solar photovoltaic (PV) potential to seek problems of alleviating pollution and CO2 emissions. Furthermore, recent addition of solar photovoltaics in countries such as India and China was catered owing to response to national feed-in tariff (FIT) payments and other incentives that aid in alleviating chronic power shortages and increasing reliability. Although PV technology is an appropriate choice for many applications in the market, high capital costs and poor installation and maintenance practices limit the overall deployment of photovoltaics. 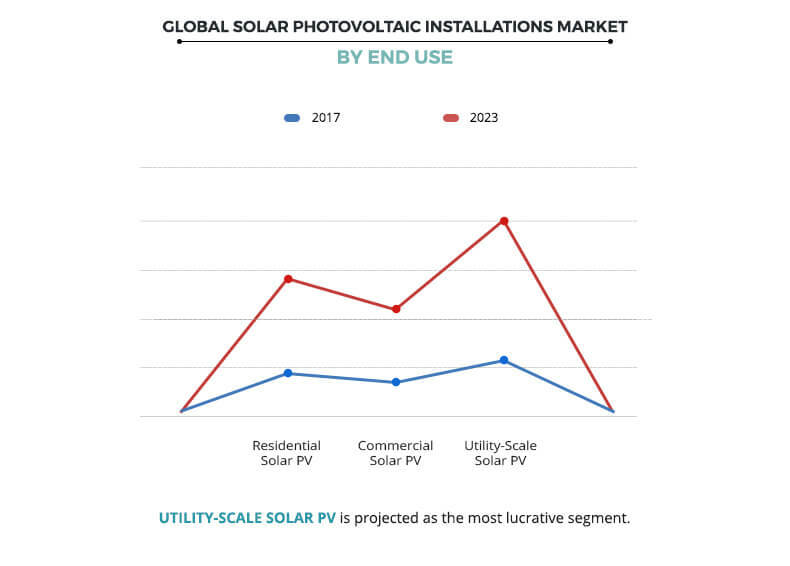 The global solar photovoltaic (PV) installations market provides various opportunities to the market players, owing to disposable incomes and rapid growth in the global economy. Moreover, surge in utility scale solar photovoltaic (PV) is majorly due to improving cost competitiveness of solar photovoltaic (PV) and growth in electricity demand. Furthermore, the rise of grid congestion issues and interconnection delays in emerging economies along with the significant hurdles in set up of new plants restrain the market growth. In addition, the delays in subsidy collection as well as problems associated with solar installations quality are some other factors that decline the market growth. China is expected to pose maximum opportunities for investment due to imminent feed-in-tariff rates, which encourage the key players to develop new energy sources, thereby reducing reliance on coal as well as reduction in greenhouse gas emissions. The surge in FIT rates is prompting key players for completion of pending solar projects. In addition, lower FiT subsidies also helps PV companies accelerate their R&D projects because of high market competition. The grid connected segment, dominated the global market in 2016, and is anticipated to maintain its dominance throughout the forecast period. Based on end use, the market is classified into residential, commercial, and utility scale. The utility scale segment is estimated to grow at a significant CAGR of 18.2%. Europe accounted for a considerable share of the total revenue in 2016, followed by Asia-Pacific and North America. Moreover, the demand for solar photovoltaics is on a rise in Latin America, majorly in Africa owing to presence of widely distributed solar resources and is expected to gain a major growth during the forecast period. Key players, which include Trina Solar Ltd, Canadian Solar Inc, JA Solar, First Solar Inc, Jinko Solar Holding Company Ltd, Yingli Green Energy Holding Co. Ltd, Renesola, Sun Power Corporation, Solar World AG, and Mitsubishi Electric Corporation invest in R&D activities to develop advanced products to cater to the requirements of the market. The other players in the value chain (profiles not included in the report) include Kaneka Corporation, Kyocera Corporation, Panasonic Corporation, Sharp Corporation Ltd, BP Solar International, Bloo Solar Inc, 1366 Technologies Inc., and 3GSolar Photovoltaics Ltd. The report provides an extensive analysis of solar photovoltaic (PV) installations market trends and size from 2016 to 2023 to determine the prevailing opportunities. The report provides extensive qualitative solar photovoltaic (PV) market trends on the significant segments or regions. The report provides key insights on strategic solar photovoltaic (PV) industry analysis of various companies and the value chain analysis of solar photovoltaic. Solar photovoltaic panels are preferred over other sources of electricity generation as they possess minimum maintenance and are pollution free. The solar photovoltaic installations market is expected to grow at a rapid pace during the forecast period. This demand is mainly contributed to the enhanced demand for electricity. Furthermore, government support has been one of the major factor behind sustaining the solar industry worldwide. Over the years, governments have implemented solar-promoting policies, including tax and electricity rate-payer subsidies, such as feed-in tariffs (FITs) to spur their domestic markets. Solar photovoltaic has witnessed significant growth in the recent years, owing to rise in importance of renewable sources of energy. In addition, grid-connected solar photovoltaic panels are widely utilized because of low material and manufacturing costs. Moreover, grid connected have witnessed great demand not only for the residential and commercial applications, but also for off-grid repeater stations for mobile phones and radio beacons. 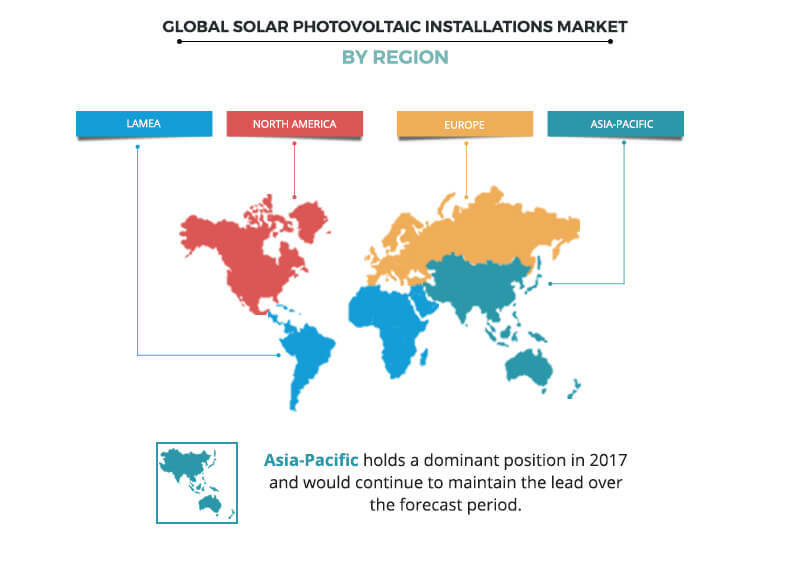 The Asia-Pacific solar photovoltaic installations market offers lucrative opportunities for key manufacturers, owing to rapid installation capacity of solar photovoltaic panels to increase renewable generation. In addition, China is actively boosting the solar installation market in order to cope up with its severe pollution problems and develop its domestic manufacturing industry. Furthermore, availability of low labor majorly in these regions has further led to solar PV production. "Solar Photovoltaic (PV) Installations Market"